Molly died at 34 weeks in her mother’s belly. Her mom received a weighted teddy bear from a high school friend and her mother knew what she had to do . . .
Tonight is the last night I have without my daughter for several weeks. Our new life of joint custody, which began 5 weeks ago, Vesta spending most nights with her father, a teacher, off for a short summer, so that I could spend most of my summer working, building my business, becoming financially independent again, and for the first time in ten years. I celebrated this last night, this last night of a sort of sick freedom that has been cast upon me by going out to a late movie with a friend and planning to sleep in. Vesta will be with me for two full weeks while her dad is away and then, as soon as he returns, he begins work again, and we go to our new-new version of life, her here with me for five nights a week. I celebrated that my daughter will return to me for extended periods of time for the next nine month by going to the movie and planning to sleep in. I came home, nearly midnight, to a pile of mail and several boxes. My new massage table and accesories in giant boxes I walked right past without even noticing. On the table were two other boxes. The first and smallest, I recognized form the return address as a gift from a fellow bereaved mother. A rock, shaped like and painted as a lady bug, Harvey’s name written (someone wrote his name!) in blue paint with a heart beneath it. Yes, a Harvey Heart. The other, I knew right away, contained my Molly Bear, my Harvey bear. I rushed to the kitchen to get the box opener and tore into them. The bear was wrapped in sparkled cotton, tight and cozy, I had to lift the whole thing out. It was heavy, 8 pounds and 13 ounces of teddy bear, of Molly Bear, of Harvey Bear. I pulled off the cotton to find the softest, sweetess looking teddy bear I have ever felt and seen. The cotton fell away, the brochures and literature from the Molly Bear organization dropped to the table and I brought this perfect little animal to my body. His arms flopped across my chest, his weighted legs dangled at my belly, my hand instinctively went to the back of his head as if to hold it up, as I held my baby again. As I held my baby again. As I held my baby against my chest like I was never able to for the wires and tubes and cold therapy and ventilator. I held this bear that felt like my baby. I cradled it’s heavy bottom in my arm held his head, felt the weight and the softness and cried and moaned my lost mother tears onto his head. Like I never did with my own baby. Like I was never able to. I stood alone in my dark, quiet house, holding the weight of my newborn, sobbing and wailing those deep, dark, animalian tones I haven’t gotten down to in months. They rose up and out of me without bidding, without effort, without thought. Visceral and true. The gutteral sounds of the animal mother, pushing and prodding her lifeless baby, newly born of her empty, bleeding womb. Alone, under the only light in the house. Alone, with the deepest of grief, with the most torn apart insides, the most broken of hearts, any mother can experience. My empty arms, full. I couldn’t put him down. I could only angle him away from my body to see the Super Man onesie he was carefully and lovingly dressed in by some stranger, some beautiful, compassionate stranger who made and dressed this bear and thought about Harvey, my Harvey, my son, who she never knew, who she never will. I ran my fingers down his chest, feeling the crinkly smoothness of the infamous “S” symbol. My finger stumbled over a hard bump underneath and I ran them over it again. Again the bump. 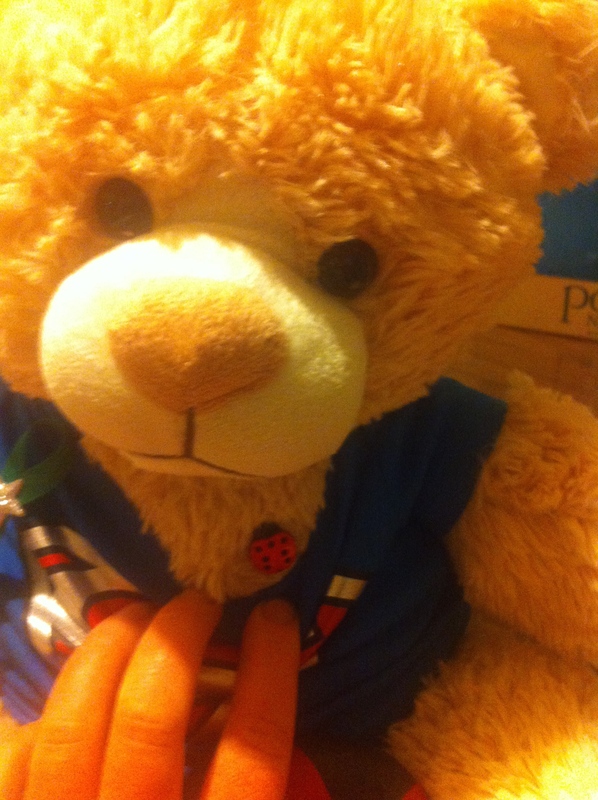 I pulled the neck of his shirt down to reveal a tiny ladybug button sewed right where his teddy bear heart is, or would be. They wrote me an email, asking me his detail, nearly a year after I ordered my bear and paid a measly $25 to cover barely the shipping for my most cherished possession. I told them his story: that we think of him as a hero for saving the lives of other babies through organ donation, that we think of him when we see ladybugs, that anyway they decorate him, with or without these things, we will be so grateful. And here he is, in my arms, with both. And I cannot put him down. I squeeze and gently squeeze his weighted arms and legs. I clutch him closer to my chest. I hold him up in front of me to examine him, to see the expression on his face, the paw prints on his feet, how his brown, little, button eyes have just the slightest imperfection in the body of the right one. I bend him forward to look at the size of the onesie, he is a big bear and I wonder the size. Newborn. Of course. I hold him again and I cry into his softness. And I remember, oh! how my body remember this exact weight, laid across my lap, my arm going numb from the weight of his head and my inability to shift him because of the monitoring equipment, the life support machines, tethering him just inches from his cold, NICU bassinet. I could not move my baby, nor did I want to. I would hold him until my arm fell off from the weight of him. And here it is again. I hold him closer and tighter and moan. The sounds of labor, the sounds of grief, the sounds of the animal, the sounds of the Earth, the sounds of the mother. I stand alone and I want my husband. I want to rush into our bedroom and wake him up and hand him the bear to hold. I want to sit on the edge of the bed with his arms around me, the bear between us and weep. I want to share this moment with him. This renewed connection. The sweetness of pure, uncomplicated grief. Just the three of us. Just Harvey’s mom, Harvey’s dad and this bear. And our deep, unrelenting sorrow. I want to share it. I don’t want to be alone in it. I shouldn’t be alone it. He should hold this bear with me and remember, too. Remember what it was like to have our son with us. To feel the softness and the perfect weight. To hold his wife, the woman who he loved and created this baby with because of that love, because of the life we planned for years included one more. But I am alone. Now utterly and completely alone in my shared grief. I have a fantasy of telling him about this bear, of asking him to meet early tomorrow, to come to our house. I imagine him walking in the door, taking his hand and leading him into the room I now share with our daughter. I see myself handing him the bear and sitting on the edge of the bed together and having that moment anyway, despite how carelessly he trashed our connection. We are still Harvey’s parents and no one else will hold this bear and feel it’s weight the way he and I do. I think next of Vesta. The first baby she ever held was the first baby I could bring myself to hold after Harvey died, 8 months later, my Goddaughter. We secured Vesta up against the couch pillows, couched her to hold Baby G’s head and place her in her arms. Vesta was a heartbreaking natural. She held her gentle, her eyes studied this new little life with the awe, tenderness and love every human does as they hold a newborn. She touched her hair and her hands and her little feet and gently said, “She’s so cute”. She knew just how to be with a baby, my little four year old. I think of the delight Vesta will have in seeing this teddy, of lifting his weight, of cradling him on the couch. I want to place that bear in her arms and say, “This is what your brother felt like, this weight, this softness.” I want to see her love that bear. Alone, holding this bear tight to my body, sobbing, fantasizing, I suddenly feel foolish. I suddenly feel pathetic, crazy. The grieving mother clutching a stuffed bear, sobbing like it’s her baby, wishing her family would do the same. I feel that scheing emptiness that arises during my ceremonies for my son, as I gaze at the latest iteration of his alter, as I run my hand across the tattoo of his handprint on my arm, as a jangle the locket with his name on it and pieces of his hair inside. The ridiculousness of it. I witness myself as an outsider, watching this mother who can’t move on without her child, grasping for these things of him, these stupid experiences and objects that represent a dead baby, someone she never knew, never will know and I pity myself. But I do not put it down. I reach for my son’s framed picture and as I do so, I shift the bear to my hip. His weight and body demand a similar action to holding a real baby, an alive baby and it’s so natural. Move the baby to one arm, to one hip to free the other to do the things a mother must do as she carries her baby around the house. And again, I have him for a moment. For a moment, here he is, shifted onto my hip but instead of for the tea cup or the breast pump or the cloth to wipe his spit up with, I reach for the picture of my dead son and I hold a teddy bear and I rejoice for a minute. A moment of normalcy. A child caught up in the fantasy, with the crown on her head, the cape down her back, the baby doll in her arm, reaching for her magic wand. I believe again. For a moment, a believe in, I become, the fairytale. What is reality or fairy tale? What is ridiculous or responsible? What is foolish or crazy or sane or childish? Clearly these concepts are relative. So much of what society teaches us about grief is foolish, unhealthy, ridiculous and insane. Catching the moment when it comes is so precious. Capturing the evanescent sensation that grounds you – even as it tears you apart – keeps a tenuous connection to our humanity. For what it is worth. Yet it is essential. Few people can bare such internal strife with comprehension and comprehension. Thank you…. I love you….